Many people said that delectable dishes are available for all four seasons. Correct! However, it is not deniable that some of them are especially more tasty and appetizing in the cold weather of Hanoi winter. The following is a list of some of the most typical snack foods that have become a part of winter Hanoi for visitors when travelling to Vietnam. Hanoi in cold days, the good smelling of grilled corn and sweet potato in a corner of night street with yellow light makes many people feel fluttered… If the autumn is woken up by the smelling of young green sticky rice and milky flower, the winter is featured by the smelling of boiled corn and grilled sweet potato. This smelling appears in all streets, all small valley, making people cannot resist because it reminds a part of peaceful childhood in the bustling day. The fresh corns and brown sweet potato on the coal stove bring a strange warm feeling. Their good smelling seems to urge the customers to enjoy immediately. Enjoying the simple snacks is to wake up the childhood memory of anyone. They make the people living in the city remember the friends in the country. Sitting on the sidewalk to eat corn and sweet potato with your pink cheek because of the hot coal is a simple hobby but make people remember forever. 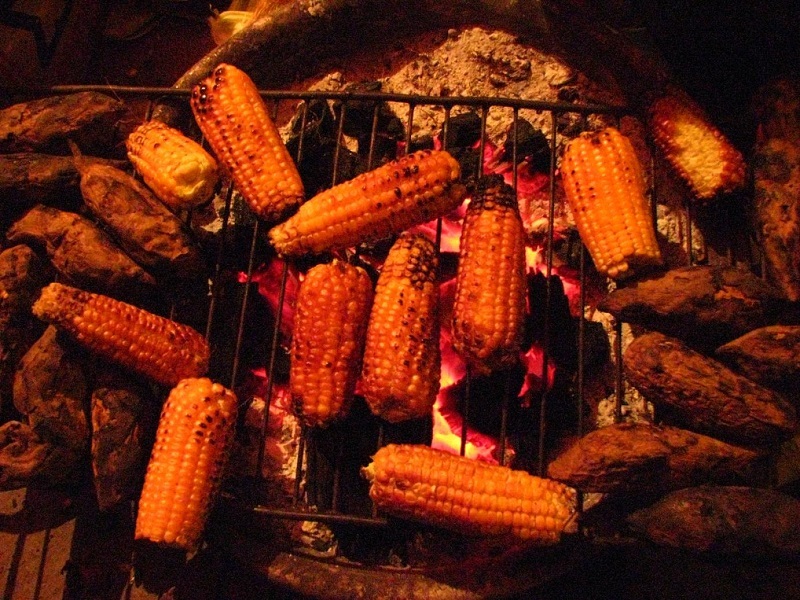 Just like that, the corn and sweet potato become in dispensable part of Hanoi’s Winter. 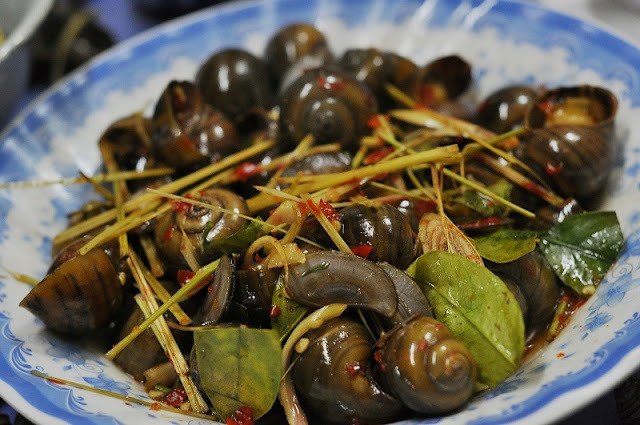 Unlike the spicy snails that are carefully fried or grilled in Saigon, the snails served on cold days in Hanoi are simply boiled. Feel the steam from the snails served with ginger sauce and lemongrass. Snails tend to appear in the rivers around Hanoi between autumn and winter. Waking up in the early morning and going out in Hanoi, you suddenly remember that it is a long time you do not enjoy Pork rib porridge, and you feel hungry. Then, you decide to go for pork rib porridge. Pork Rib porridge stand situated in the sidewalk of Hang Bo Street has existed for many years and the porridge here is quite intriguing. A big bowl of porridge full of fried dough sticks and salted shredded pork costs only VND8,000. The stand is small and located in the sidewalk but attracting a lot of people from the elder, children, to the young. What better than eating a hot bowl of rib porridge in the early morning. 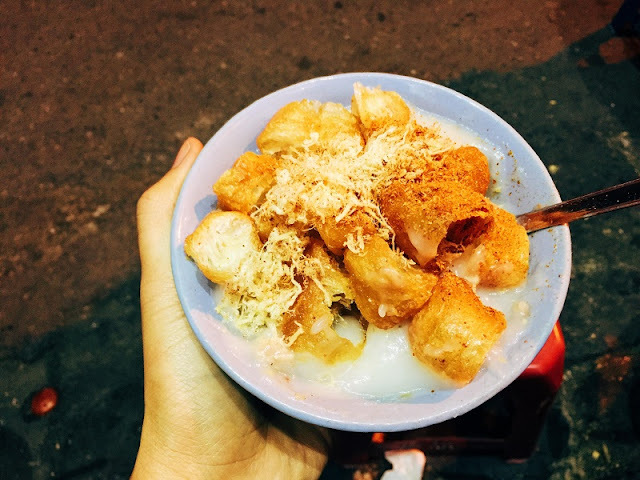 A tasty bowl of porridge with crispy fried dough sticks and fragrant salted shredded pork and the noise in the sidewalk in the early morning, all of them are enough for a satisfying breakfast. During cold times in Hanoi, hot chestnuts were more than a snack. They drew people together and helped to ease the dreariness of winter. Even today, when living conditions are much improved, Hanoians recall long-ago scenes of roasting chestnuts with fond nostalgia. Because of their hard shell, chestnuts are first boiled before being roasted with salt or sand. The latter ingredients help to keep the nuts from burning. 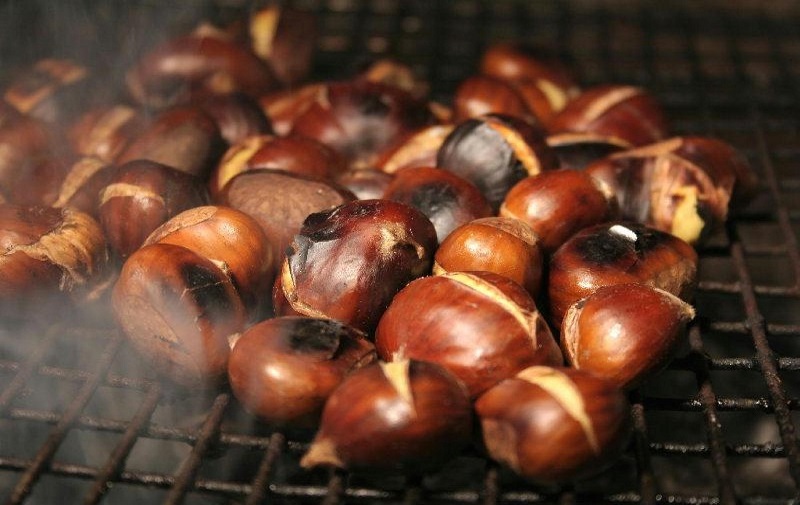 The secret to roasting perfect chestnuts is knowing how much to heat the pan. While chestnuts may be found all over the city, the best are reputedly sold on To Tich Street. Upon removing the brown shell, the while chestnut is revealed. Part of this snack’s allure is its scent, which makes people feel warmer. To prepare chestnuts at home, be sure to boil them for 20 minutes before roasting. With a wealth of imported snacks on offer, Hanoians are still drawn to buy bags of roasted chestnuts when the weather turns cool. On a winter’s night, some lovers are sure to be wandering Hanoi’s streets sharing a bag of steaming chestnuts.